Counter Corner brings together performance artists like drag queens and kings. Counter Corner hosts, Juleisy y Karla. The goal of the party is to be more gritty, real, and raw. At the most recent party in December, people showed up in onesies, capes, and outfits of their own design. Everyone seemed to know each other. ‘Dancing like no one was watching’ was the order of the night. After a surprise burlesque performance, champagne dripped down from the stage lights. Outside 1306 Miami, the event space that houses Counter Corner. The party was created by Miami artist Sleeper and the performance artists known as Juleisy y Karla, out of their desire to create a space where everyone felt welcome and comfortable in their skin. Their goal was for Counter Corner to be a place for queer people who might not have been vibing with the traditional Miami gay scene. “We were just going against the grain with all the other gay parties. All the other gay parties just catered to this cisgender heteronormative lifestyle, with the washboard abs and the really pretty people,” said Josue Garcia, one of the party's co-founders. He is also known by his stage name, Karla. Though it originally started in 2014 at the Corner Bar, a few blocks down from 1306 Miami, the party outgrew that space and moved last June to its current location. Garcia said he felt that other spaces weren’t giving them the opportunity to really do the kind of art they wanted to do. At the same time, it seemed that Miami was the perfect place to really build a party like Counter Corner from the ground up. “Miami is its own beast in that sense culturally, economically, spiritually, we're on a different wavelength than the rest of the United States, so I think nightlife and party culture is going to reflect off that,” said Gio Profera, better known as Juleisy. As opposed to New York and Los Angeles, which have more established queer artistic spaces, the fact that Miami is a relatively young city and is still growing allows for the artists to make the space into whatever they want it to be. “We’re so far separated from everybody else, we’re more innovative because we have to wear a lot more hats as performers, as artists, as party throwers. I feel like in Miami you really see the passion in the artwork,” said Josue. To get into the party you have to be 18, not 21. That doesn’t usually happen in the Miami nightlife scene. “Not only are we throwing an event; we’re creating a community, a safe space for people to go out and party. And going back to the youth, there’s so much more at risk for being LGBT so we want to include them as soon as they have a chance or opportunity to come see: I’m not alone. I can be comfortable, I can wear lipstick, I can be myself,” said Profera. Juleisy y Karla (right to left) at Counter Corner's third year anniversary. There’s no cover charge for the party so that it is as accessible as possible. But there are also three different kinds of wristbands and security staff on duty to ensure everyone’s safety. For Profera, safety is not just meant in a physical sense, but also an emotional one. “[It’s a] safe party zone. No one’s going to judge you. You come as you are. No dress code, no egos, no labels,” he said. 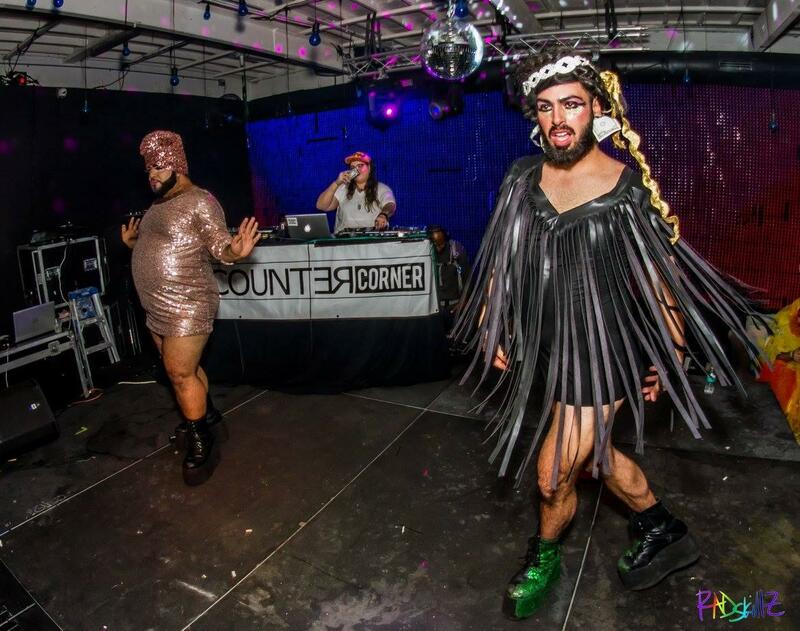 He would like to see Counter Corner be to Miami’s queer scene as Studio 54 was to disco, and though there’s still a long way to go, they’re just enjoying the ride for now. “A lot of artists and creators leave this city and I feel like it’s really important to stay true to your roots and stay exactly where you are and make sure that the city grows. I think Counter Corner’s main mission is to leave an impression on the city,” said Garcia. This impression is certainly felt by the many artists, performers and drag queens who have gotten their starts at Counter Corner. Many of them have gone on to win awards and accolades such as Miami New Times’ annual “Most Interesting People in Miami.” One of those spots went to Miss Toto. When Miss Toto moved to Miami from Maryland three years ago to attend the University of Miami’s Rosenstiel School of Marine and Atmospheric Science, she was going mostly by William “Rock” Evans. That changed when she met Juleisy and Karla in the summer of 2015. Though Miss Toto, 25, had been dabbling in drag here and there it didn’t become a large part of her life until after that summer. Now, not only does she perform at Counter Corner and other events throughout the city, but has her own bingo nights at Gramps, a Wynwood bar. And her drag persona has fleshed out . 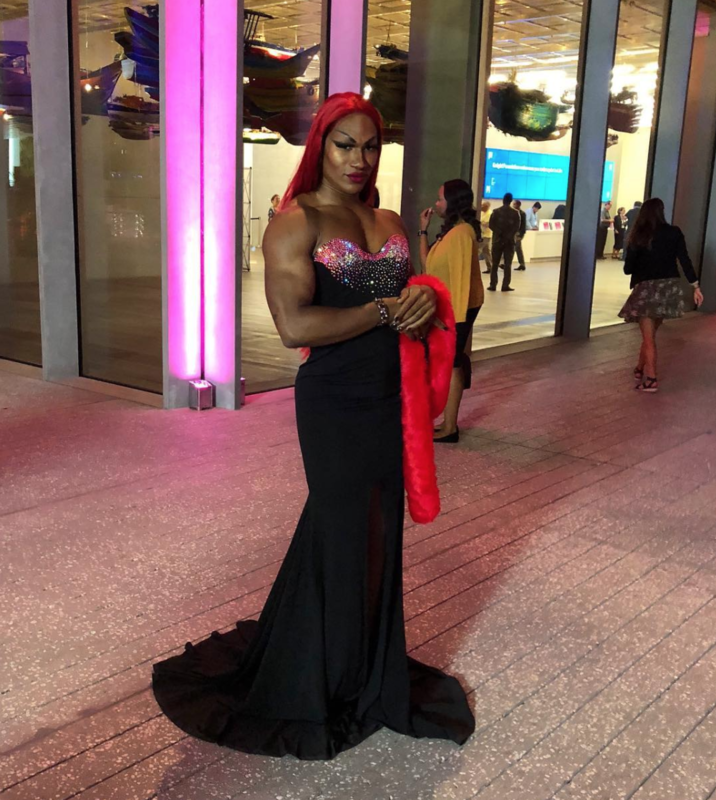 “I’m known as the Serena Williams of drag. As far as I know, I'm one of the only bodybuilding drag queens. With Miss Toto, it's the whole concept of I'm going to give you this completely feminine character with the masculine look,” she said. Miss Toto at the Knight Arts Challenge gala. When Miss Toto isn’t performing or bodybuilding she helps tag sharks for UM and is a personal trainer. Counter Corner not only allowed her to develop this persona, but she said that it created a safe space for anyone to explore boundaries and binaries. “I really believe Juleisy y Karla were the pioneers in creating that solid community that continues to go out to support each other,” she said. It's a community that has now expanded beyond Counter Corner’s walls. “A lot of younger people have started doing parties, and it's such a great feeling to see the scene grow. A lot of other things are popping up that you didn't see before,” said Sleeper. The party is not in a traditionally queer space. And that’s important for the creators; they want to turn a place on its head and make it into a welcoming space for everyone, opening up more opportunities for the queer scene in Miami to grow. Many events like Miss Toto’s bingo night and ‘Double Stubble’ happen at Gramps, which is not a gay bar. Counter Corner started at The Corner Bar and is now at 1306 Miami—two places that are also not associated with gay nightlife. “I feel like the queer scene and the gay scene in Miami is more interjected and intermingled within the rest of society,” said Garcia. Flaming Classics is another event happening in a non-traditional queer space. It’s a film series at the Bill Cosford Cinema at the University of Miami that started on May 2017. The series received a grant as part of the 2017 Knight Arts Challenge in early December. “It's a film series that we do, taking films from the queer canon and pairing it with drag performances from local drag artists” said Trae Delellis, co-founder of the series and a UM professor. Delellis sees Flaming Classics as a different kind of space, not necessarily a nightclub or bar scene, but a place where all ages can enjoy drag. 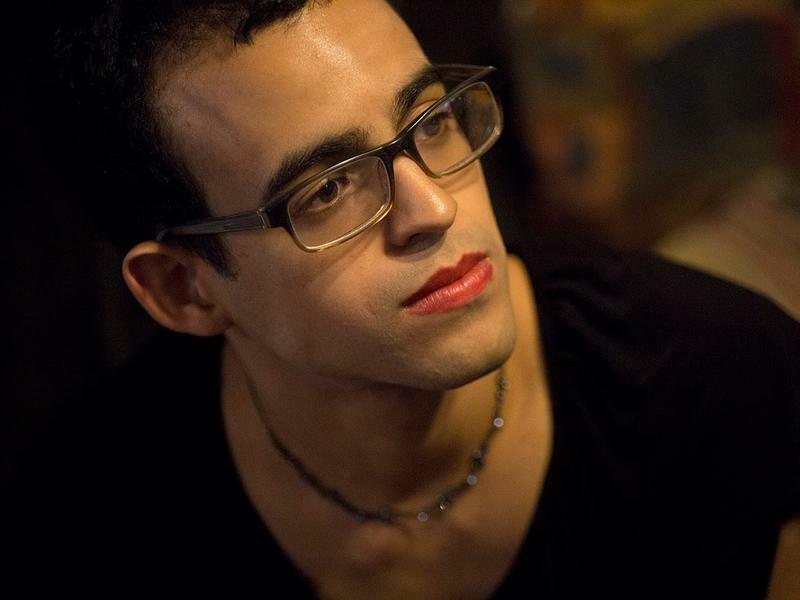 Juan Barquin, co-founder of Flaming Classics and writer at the Miami New Times, gives credit to Counter Corner for bringing in a type of counterculture queer performers. “There's like a performance art aspect to what is in the scene that is growing right now, and that pairs really well with what we're doing which is a theatrical kind of experience. If you look at how the queer scene has evolved, I think it all changed with Counter Corner,” he said. The performances are inspired by themes of the films, providing another layer of interpretation for the viewer. “These [are] very intense performances sometimes, but they're fascinating, and it is kind of just legitimizing drag as art,” said Barquin. “We're going to be able to video everything and be able to kind of create a queer archive,” he said. Both Barquin and Delellis mentioned the inherent queerness that surrounded Art Basel this last year. For them, keeping Miami queer is about maintaining these events year round. “I think keeping Miami queer is difficult. You have to be vigilant, because it’s a city that can seem so commercially oriented. And you see things like Palace [Bar] and other queer spaces having to sacrifice their space because rents are going so high,” said Delellis. Counter Corner and Flaming Classics have become spaces for people like Miami-native Jaxx Garcia, who didn’t particularly see herself reflected in the gay spaces that already existed. “When you're gay you seek out what's most immediately accessible, which is all these gay bars, and that fulfilled me for a little bit but I never really saw myself. There were a lot of gay white men and a lot of white lesbians. But I was like, where are the weird bisexuals? I wasn't seeing myself,” she said. She first went to Counter Corner in May 2017. “When I was there it was like Dorothy in Oz," she said. From that moment on she started developing her drag king persona, known as Andro Gin. Though she is still discovering what he is about, she calls him a “creature king.” She performs as Andro Gin at both Flaming Classics and Counter Corner. With the emergence of both Counter Corner and Flaming Classics, Garcia now sees that there’s different scenes (both gay and queer) that people can try out and feel what’s right for them. She hopes that this will only fuel more creativity within others. “Before Counter Corner there was no Counter Corner. They had to start it to make it happen. And then all these other events like Double Stubble at Gramps and Flaming Classics. You get inspired by other artists starting things and it kind of does this domino effect of creation,” she said. “It’s just so great to come out and be with people and unapologetically who they are. Like I don’t care about what I’m wearing, what others are wearing. Just to be here and be having a good time,” said Vi Andrews, 23, a recent Florida State University graduate. She’s back home in Miami and was checking out the party for the first time. Jaxx Garcia said she believes in the special aura of creativity that the city of Miami carries.